Dafabet are currently offering a few special football promotions. One of these is the chance to earn a refund, as a free bet, of up to £50 if you place a Correct Score or Half Time/Full Time Bet and the match ends in a goalless draw after 90 minutes. The maximum refund is £50 as a free bet, and in order to qualify for the offer you must place a single bet of at least £1 on either the Correct Score or Half Time/Full Time Market. Each qualifying bet must be placed pre-match, so in-play bets do not count. There is no need to opt-in to this offer, which will save you time. As you would expect, there are some terms and conditions to be aware of. Firstly, if you were to place more than one bet on the relevant markets in any one match, only the first bet will count towards qualifying. It must also be explained that only losing bets will count towards the promotion. So, for example, you could not place a 0-0 Correct Score bet and receive the refund if the match does indeed finish goalless. Any bets placed in an accumulator will not count towards the offer, and neither will any bets placed on a Dafabet Price Boost (enhanced odds) market. Unfortunately, if you live outside of the UK and Ireland, you will not be eligible for this promotion. Any football match is eligible for this offer, which will help when we are looking for close matches between the odds on the Dafabet site and those on the exchange. When you have placed a bet within the offer terms and the match does indeed finish 0-0, your free bet will be credited into your account within 12 hours of the match ending. The free bet must then be wagered on a selection with odds of at least 1/2 (1.50) before you can withdraw the money. The free bet cannot be used on draw, voided, refunded bets or bets placed on Horse Racing, Greyhounds and Harness. When using matched betting techniques though, we will be looking for odds of at least 4/1 (5.00) to bring us a decent profit anyway. If we find close matches, it allows us to have numerous attempts at hitting the free bet, for minimal qualifying losses. If you do hit the refund, the free bet can then be converted into real cash. With advantage play, this offer is worth around £4 each time. 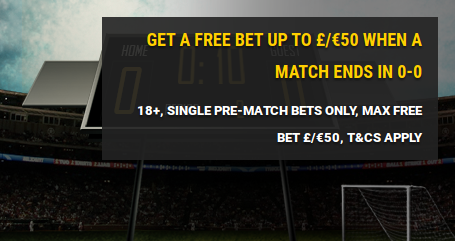 The Dafabet Goalless Draw Free Bet offer is one of many promotions listed on MatchedBets.com. MB Premium members can benefit from this as well as much more, thanks to our step by step guides and industry leading experience. Benefit from a free bet refund up to the value of £50 if the player you have backed to score first scores the second goal instead. Bet with Dafabet and if the Starting Price price on a horse is bigger than the price you originally took, they will pay you out at the bigger odds. Dafabet Acca Free Bet. Make money matched betting with Dafabet football accumulator insurance. Get a free bet if one leg of your 6-Fold or bigger footy acca fails. Dafabet get up to £30 free bet. Create an account and place your first bet, if it loses receive up to £30 free bet. Make an expected matched betting profit with the Dafabet free bet offer. *Profit values vary, you'll likely make more, but you could make less.